The low idle temps are indicitive of the same "peak" phenominum (sp? :) ) as I mentioned WRT to load temp averages. Because the IC7 seems to transfer heat quicker (hence the +/- 2c swings when MX2 is staying stable) I suspect it caught the lowest point even if it was only for a fraction of the cycle. The graph at the top is the IC7 and the one on the bottom is the MX2. Don't get caught up with the actual posted temps, as these are coretemp temps, and I'm not even sure if these MX2 readings are the actual ones from the run that ended up being recorded... I only know from the time frame that they are MX2. If you look at the temps on the top graph (IC7) you'll see that the lower "load" temp is fairly consistant, while the max "load" temps are temporary spikes rather than the norm. Looking at the temps in the lower graph (MX2) you'll see that the trend is just the opposite. On this graph the higher "load" temp (max) is fairly consistant, while the temporary spikes tend towards the lower temps. Based on this, I'm pretty sure that the IC7 "average" temps over the whole 1 hour time frame would be at least 1c better (probably more) than the max/min peak readings would indicate. Does that make sense folks or am I looking at this the wrong way? Very interesting, SS. Looks like I'll have to try some graphing of my own, just to see if I'm getting similar behaviour. Been scratching my head a little over my own results so far, which are generating some anomalies of their own. Not the least of which is the fact that I'm seeing evidence of IC7 still curing (i.e. temps slightly improving) 12 hrs into a P95 burn. Beginning to wonder if I'm suffering from inadequate contact pressure, although my Fuzion V2 should be putting plenty on the IHS. Going to try spiking the springs for my fourth round of tests, see if that changes anything. Please do. I'm very interested to see if anybody else is experiencing the same type of behaviour with this tim. I looked closely at it because I noticed that the load temps of the IC7 during benching seemed to indicate temps which were generally lower than the max temps I was getting. 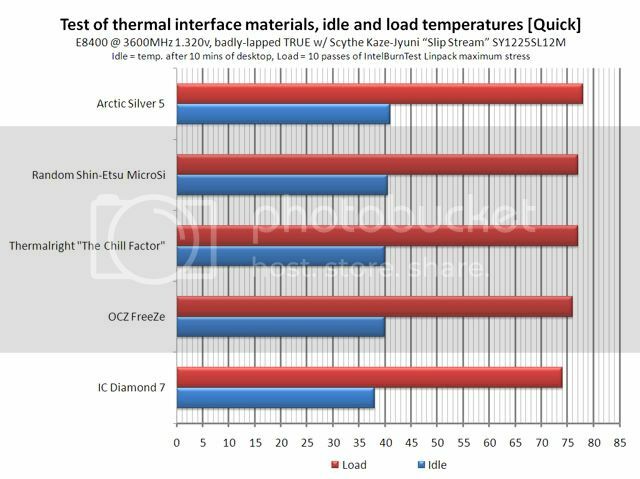 Seems to me somebody else mentioned temps which fluctuated by a fairly wide margin as well (edit: Found the post I was thinking about... http://www.hardwarecanucks.com/forum...tml#post169471 ). I suppose it could just be the mount I'm getting, but I'm theorizing that the IC7 medium might allow temp changes to transmit faster and that a WC loop wicks away heat fast enough for that to show up in the graphs. I also noticed that the idle temps seemed to drop faster with the IC7 mount during the 30 minute cool down after load testing. Last edited by sswilson; April 13, 2009 at 11:16 AM. The biggest and best difference I did find is that both cores are more inline with each other. No more having a 4-5C Difference in temps. Same thing Happened to me SS, I got a slight drop Initially , and then after the Hour long Prime Burn , I showed Better Temps right at the end. The only one that gave me a World of issues was the AMD Mount, I got fluctuating Results until I got it seated properly (IC7 Wasn't Exclusive, It was a matter of getting the Right Spread , OCZ Freeze and Ultra Thermal have done the Same to me in the past). All in all, it looks promising in the end.